A man desperate to give away his fortune and his wife – desperate to stop him – go to extreme measures to get what they want in the world premiere of George F. Walker’s The Burden of Self Awareness. Paul Rainville and Eric Coates. Photo by Andrew Alexander. Michael is a multimillionaire who wants to give away his money and live like the middle class, due to a life changing incident. His wife, Judy, won’t stand for that – she’s gotten used to her life of luxury and keeping her husband at arm’s length with their wealth. Complicating the situation is the prostitute Michael has been seeing, who has ambitions beyond her current profession, an ineffective psychiatrist and a private eye who finds himself caught in the middle. The Burden of Self Awareness is about selfish people doing selfish things, and the script is very good at what it does. George F. Walker’s work is infused with profanity and dark humor. This production has the feel of a Coen Brothers movie, featuring dark humor, characters motivated by selfish reasons and the sense that none of this really matters in the grand scheme of things. Despite that sentiment, Walker keeps his audience enthralled with quickfire wit – and it helps that a stellar cast delivers these lines with gusto, spitting them out so that the pace never wavers. Paul Rainville is a highlight as the worst psychologist ever. He bumbles through everyone’s problems, making them worse instead of better, and manages to seem good-natured even through his character’s descent into depression. Eric Coates’ GCTC acting debut is well done. His character does come off as a little cold, but I feel like this was the intended effect. Sarah McVie is magnetic as Judy, the wife who is going just a little crazy over this whole situation. She hits the right crazy notes, but still managed to make me feel empathetic for a character who is afraid of changing her way of life. John Koensgen is amusing as the worst private eye ever, a gullible born again Christian who also finds himself in the middle. Samantha Madely is excellent as a high class prostitute involved with Michael who sticks herself into the situation. However, I didn’t feel there was much chemistry between Madely and Coates, making the ending a little hard to believe. 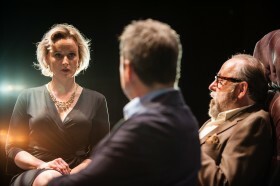 Sarah McVie, Eric Coates and Paul Rainville. Photo by Andrew Alexander. The downside to The Burden of Self Awareness really is the ending. Based on how the second act begins, I anticipated a big blow up and was really looking forward to seeing who made it out of this situation. The climax indicated that something big was going to happen – and then it just ended, going out with a whimper instead of a bang and a character decision that didn’t seem to make much sense. I was still a little bewildered during the final blackout when the audience started clapping -was that really it? Despite an anti-climactic finish, The Burden of Self Awareness is hilarious and witty, dark and just a little shocking at times. It closes out the GCTC’s 39th season on a high note and even though is has its flaws, it’s well worth seeing for those who are a fan of dark humor. But that’s just my opinion and I’d like to hear what you think. Who stood out in the cast? What did you think of the profanity and dark humor? Let me know in the comments below! 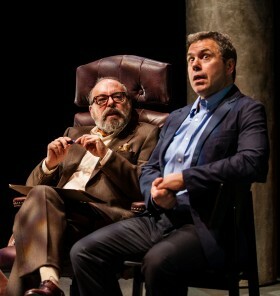 The Burden of Self Awareness runs until June 22nd at the Great Canadian Theatre Company. For more information, check out our preview article.